GForgeNext is the newest incarnation of our long-lived project collaboration tool. It ties together all of the most important features that teams need to deliver big things – like task tracking, team chat and integrated source control. And in the next several months, we’ll add a lot more. Next employs a Single Page Application (SPA) front end, and relies on our public REST API for all of its functionality. 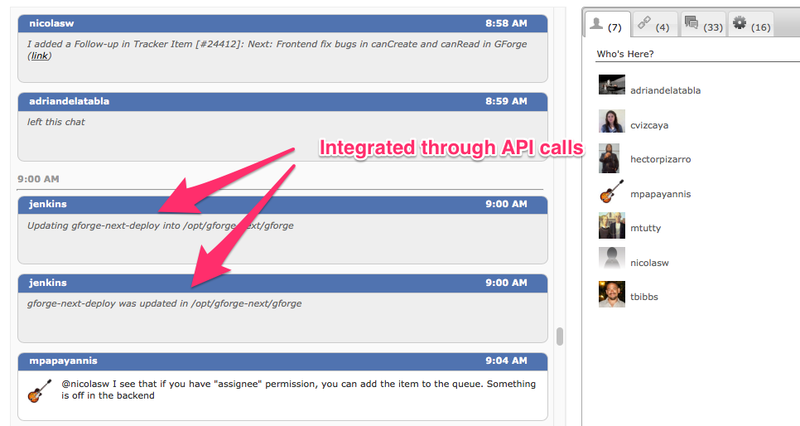 Everyone can now build great tools and integration points with GForge using the same REST API that we do. On that topic, then, let’s explore the API and build an example or two. REST deals in resources. In our case, things like users and projects. REST uses the HTTP verbs you already know to get things done. GET, POST, PUT and DELETE are the most common. REST also uses the same HTTP response codes that web pages use. 404? That record doesn’t exist. 400? You submitted something invalid. 500? You broke it. REST uses the normal query string and request body that HTML pages use. Data is typically exchanged (submitted and returned) in JSON format, which is easy to handle on most platforms. Our REST API also accepts regular FORM POST format, so it can be called even from static HTML pages or libcurl. All of the resources, methods and parameters for the API are documented in our API Docs. GForge has very deep and flexible access controls, and the data you receive from the API will usually depend on the user requesting it. You can submit a separate user ID and password with each request, or get a session ID (from the /usersession endpoint). The POST verb is used to create data on the server – in this case, a new session ID is created if the user and password match up. You can then use the session ID in place of the password for further requests. In a browser, the session ID will also be set in a cookie just like visiting the login page on a web site. Note that you have to include the session ID for both the authentication and to specify which session to delete. Now that we have an authenticated user, we can use it to get data from the API. How about the user profile for a friend? Read the API docs, and see what you can get under the /api/user and /api/project endpoints. There are a whole bunch of sub-entities within each one. Then maybe move on to /api/tracker or even /api/trackeritem to see tasks. Got questions? Comments? Bugs? Leave a comment, or find me on Twitter @mtutty. A couple of weeks ago, Tony shared some screen shots of GForge Next, and talked about how we’re designing it to Get Out of Your Way. Today, I’d like to talk about the other end of GForge Next – the API side. It’s true – the current GForge has an API, and it has for over ten years. But it’s……not awesome. If you have ever worked with SOAP services, then you know they can be overly complex, verbose and yet inscrutable. Not to mention it can be fragile, especially between different platforms (I’m looking at you, Java/Axis/Axis2/XFire). 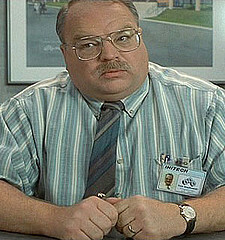 But the real flaw in our SOAP API is that is was bolted on to the existing code. There’s quite a bit of logic shared between the GForge UI and the SOAP API, but also some duplicate code, so the API won’t always act the same way as the good old web UI. As we continue to fix bugs and add features, it continues to be an extra effort to maintain these separate code modules and keep them working the same way. Like everything else with GForge, we are our own worst critics, and our own first users. So it was easy for us to decide that to be useful, the API had to be an integral part of the system. The entire GForge Next UI runs against the API. Logging in? API call. Getting your list of assigned tasks? API call. When we use GForge Next UI to accomplish tasks, we’re also automatically making sure that integration via the API will work for all of those use cases. For wire protocol, we chose REST (like pretty much everyone else these days). JSON + HTTP (GET, POST, PUT, DELETE) is a pretty simple, readable and capable combination, and it aligns nicely with the other parts of our technology stack (like AngularJS and Bootstrap). 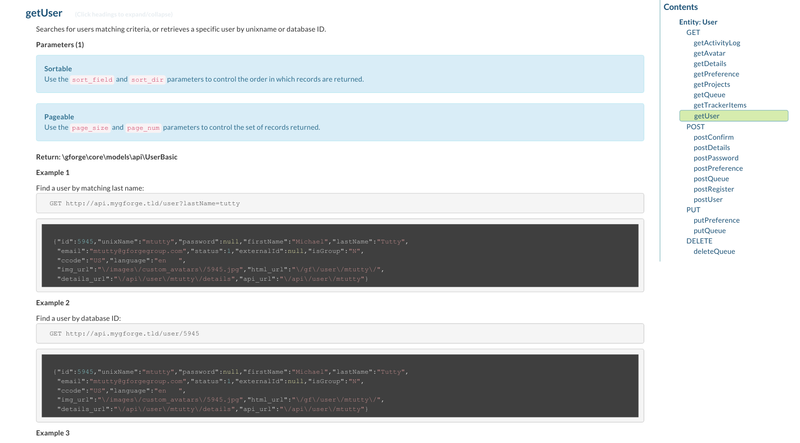 The API is even self-documenting thanks to code-comment blocks in the underlying services and our /apidoc endpoint. The API docs include all the entities, methods, parameters and even example input and output. As we continue to add and change the API , the docs are automatically up to date. The ID or alias for the object, as a number or string value. For example, ID 2000 or the short name mtutty for a user. A JS object with an ID property, with the same value as the above bullet. In general, the API back-end will work pretty hard to figure out what value you’re trying to use, and go find it based on the ID or key value submitted. We also support vanilla FORM POST semantics, so that regular HTML forms, curl and wget requests are easy to do. So it’s pretty easy to create a basic CRUD API for a set of related tables. The current GForge Next database has about 137 tables, which is a bit more complicated. Add to that the fact that most realistic use cases (including our own UI views) are going to need multiple types of data, and using the API just went back to difficult and confusing. Well, maybe not. Largely for our own needs, we started adding related data as optional for many API calls. By adding “rel=xyz” to a GET request, you can ask the GForge Next API for additional data that is related to the entity (or entities) you’re requesting. So for example, GET /api/user/mtutty/details?rel=projects,activitylog includes the most-used projects and most-recent activity records for me. That’s all the data needed for the user profile view, in one call. Don’t need all that extra stuff? Don’t include the rel, and you can get the payload down from 3.6K to 963 bytes. Here are a couple of ways we’re already using the API (outside of our own UI) to keep project data and knowledge moving, even when things are happening outside of GForge. Build and Deployment Activity – We use Jenkins for CI/CD (and deploy GForge Next several times every day). Whenever builds start or fail, or whenever a deployments starts or ends, we use the REST API to log an activity record. This is visible in the Project Home page activity view and in the project chat room (which is where we see it most of the time). Now as we’re working on tasks, we can see not only what tasks other people are working on, and their funny cat pictures, we can also see our build kicking off, and code going live, in real time. Customer Feedback – First Dozen users will notice the green “Feedback” tab on every page in Next. That tab submits data to a separate Tracker called, well, “Customer Feedback”, using the API. Technically it’s part of our site but we have made a conscious effort to keep it separate from the AngularJS application that contains the rest of GForge Next. The Tracker template will be available in GForge Next, and eventually we’ll make the widget available too, so customers can collect feedback from users directly into their GForge Next project. While we are excited for the new REST API in GForgeNEXT what really excites us is the creative ways developers will use the API. 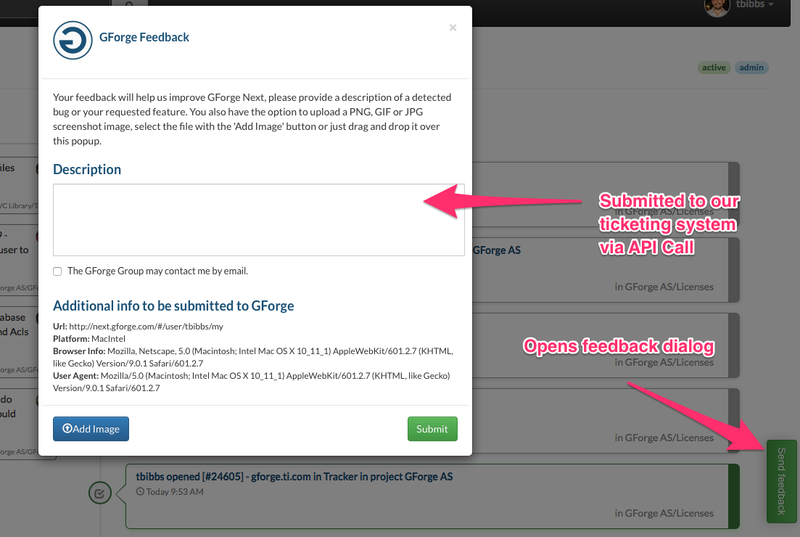 Because the API is new and will continue to develop, we really hope you consider signing up for early access to GForgeNEXT. Those requesting early access will can expect the beta to begin officially over the next couple of weeks which will include immediate access to the API. Basically, it says we need to breathe before bothering with staying warm. And we need to eat before worrying about having any friends. And we really can’t spend any time following our dreams until we’re clothed, fed, warm, have some friends, and overall feel pretty good about ourselves. 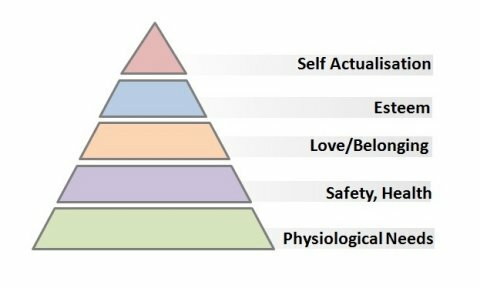 It seems natural to me that product-driven companies would follow a similar sort of hierarchy. There’s a fairly common progression of needs that a company must satisfy in order to survive, grow and succeed. In trying to figure out which GForge features you’ll really need, and in what order, I’ve come up with these buckets and given them catchy Greek-themed names. We’re using these buckets to guide our feature deployment for GForge Next, so that we meet the needs of new users easily, and give them more features as they begin to need them. The most basic level of business development. This model depends heavily on large efforts by a small group. Their roles, interactions and dependencies may be somewhat defined, but most processes are still ad-hoc, and are created, revised and discarded based on immediate needs. Generally, boot-strapping – that is, getting to market on little (or no) financial budget. Initial product/service delivery to see if the business model is viable, or trying to bring in the first customers to fund further expansion. Task/Issue Tracking – First and foremost, a persistent list for who is doing what. The group is very small, self-directed, and self-organizing, so features like metadata (e.g., severity, milestone, priority, workflow by status) and access control are not important. Version Control – Whatever type of product (software, design/creative/mkting, manufactured goods, etc. ), there will be some kind of source code, documentation, images, or other output to be kept safe and trackable over time. Project Chat – A live, persistent and searchable scratchpad for quick discussions, news and humor without having everyone leave their desk. The first big change in team organization. Initial product may be out, customers calling for support, feature requests, etc. Team’s focus is still more tactical, day-to-day, but the group is growing to handle success. Working some things in parallel, especially support tasks vs new features. Leaders are focused on finding more customers, and keeping current ones happy. Product delivery functions need to be automated, to allow tech staff to focus on what instead of how. Customer service, support, operations and development tasks need to be centralized so that everyone can stay focused. Knowledge needs to become somewhat portable so that team members can be added, back-fill others and cover breaks/days off. Document Management & Wiki – Create a culture of portable knowledge early, and staff will maintain docs out of habit. This makes it easier for players to switch positions, cover others during crunch times. Standups, Sprints & Milestones – Start to group tasks into small projects and track overall completion. Allow different milestones to start competing for resources. A first step toward portfolio management. Ubiquitous Search – Make it brain-dead simple to find that thing you saw a month ago, and share it with others. Things are really under way. Founders may be somewhat disconnected from daily operations. With monthly cash flow ensured, leaders begin to reach out to partners, competitors, upstream/downstream value chains, trying to expand customer base and/or find new features/products to add. This phase usually includes the first serious wave of new hires who were not present at the founding of the org. Cycle times get larger and more unpredictable as internal process and technical dependencies begin to weigh on the system. Staying agile and responsive is even more important here than in previous phases. Partners and competitors begin taking the product and company seriously. This means real contracts, real accounts won and lost based on delivery. At the same time, the heroes from Atlas phase are no longer able to touch everything every day. At this point, the steering function has become as important to success as the rowing function. Management needs to be able to see into the future, predict outcomes, plan for contingencies. Start to segregate knowledge to insulate groups from information overload and keep them focused. Develop a strong need for metrics and measurement, instead of steering by feel. Want standardized processes to allow for apples-to-apples comparisons over time. Robust Roles and Access Control – Organize things according to company structure, lines of business, etc. Begin to control access by org and project membership. Allow selected people/groups to collaborate from outside the company. Workflow and Audit – As complexity and required quality levels both grow, more detailed workflow and audit trails are required to keep things moving quickly. There is so much wrong with that post. But I’m in a hurry and don’t have time to put down 3000 words deconstructing Oracle’s entire business model and world-view. Instead, I’ll just explain how we do the exact opposite. GForge offers up the entire(*) code base for customers to examine, scan, and even change. We maintain customer-accessible Git repositories (on gforge.com, of course), so that customers have constant access to the current released version (that would be 6.4.1) and the version that’s in development, which we also deploy and use ourselves every day at gforge.com. GForge customers can maintain their own Git repo (with, say, custom theme elements, or code to integrate with a custom database, or whatever), pull from ours, and keep up to date with new features, security patches and everything else we come out with. As if that’s not easy enough, we also regularly send patches to customers to fix specific problems they report, even if they’re not at the current release version. You don’t have to wait six months for the Oracle mega-patch, and get 3000 other changes you didn’t ask for. Lastly, customers can (and are encouraged to) send us patches for things they have fixed or improved. When Tony and I were GForge customers, we did this on a couple of occasions. You’re welcome. Every day, we try to treat customers the way we like to be treated. Customer access to the source is just one reflection of that value. PS – As if on cue, here’s a great example of why you don’t want to wait six months for the vendor’s bug fixes. *Okay, okay. There’s one file that we encrypt, that handles validation of the customer’s license key. I know Richard Stallman is pro-actively spinning in his grave, but if you really want to see what’s in there, I’m sure we can arrange something.